First, they identify lead magnets that get them results. Second, they put 100% of their resources into creating and delivering those lead magnets. But you are probably wondering - How do I create lead magnets that generate results? People who visit your website are looking for ways to solve their problems. Your opt-in offer should focus on a problem common to your target audience and proffer a solution it. When creating your lead magnet, bigger is not better. A lead magnet should offer something that your visitor can quickly use to solve their problem. It can be a two-page checklist, a 5-page report, or a 10 minute tutorial on how to do a specific thing. Remember that most of these visitors who will subscribe to get your free lead magnet are novices. They want to know more. So, create something simple that they can easily understand. When you offer lead magnets to your audience, make sure they can be accessed immediately. Don't keep them waiting for it. Remember that people love instant gratification. Lead magnets that will convert well and generate tangible result must have a consistent message. For instance, if you create a blog post about Juicing, your lead magnet should not be about food recipes. A lead magnet that will convert should take them more into the topic. The lead magnet, in this case, can be about “diverse types of home-made juice”. That way you will get more leads because it is relevant to the discussion now. Don't just throw some content together because you are giving it away for free. Create a high-quality lead magnet that your visitors will perceive as high value. Well, now that you know the rules of creating a lead magnet that converts, it is time to come up with lead magnet ideas. This part is not as hard as you think. We bring to you 7 ideas of proven freebies that will help you generate more leads. Make sure you bookmark this page so you can come right back for some inspiration. It is becoming increasingly difficult to get people to sign up to email lists these days. A great way to get them to part with their email address is by using quizzes. A quiz is entertaining and funny and produces a huge wave of engagement through your audience, for example one online quiz received more than 12,000 comments. A quiz can help you to create a positive customer experience with your audience. It also gives you insight into the life of your customers and motivates them to share their personal information. Besides, it works better most times than using free content or resources. Most of all, quizzes have viral sharing power than other lead magnets. 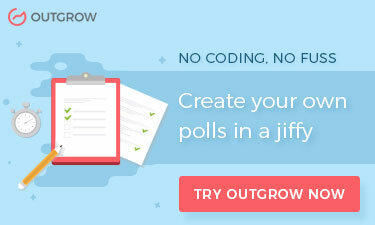 According to Buzzsumo, quizzes get shared 1,900 times. 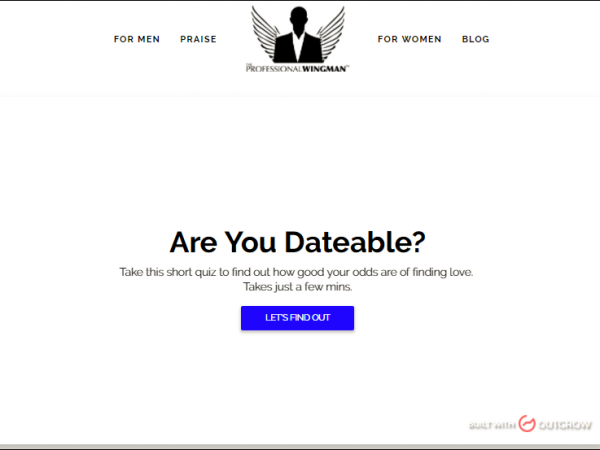 There are two types of quizzes you can implement on your website: Trivia and personality quiz and Knowledge quiz. Trivia quiz asks your audience popular questions they will be curious to answer. Personality quiz is about creating questions that show users personality. Knowledge quiz tests a user's understanding of a particular topic. It helps users to know gaps in their knowledge and find ways to fill it. The knowledge quiz gives users insights about your product and services. You can gate the answers to the quiz so that they sign up before they see it. However, it is a good idea to add a skip option so that they don’t feel pushed. The answers you get from your quiz users are much more valuable than the email itself. It provides insight on what kind of content you can create for your audience, having known them through the quiz. 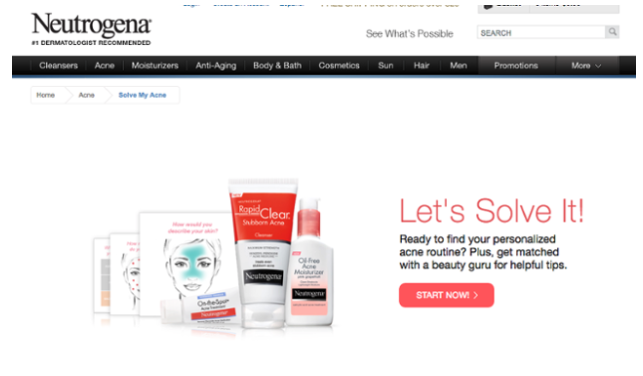 Example: A quiz designed by Neutrogena to enable their users solves their acne problem. If you want to have some fresh ideas in how to improve your conversion rate using quizzes or calculator check out this post. Free E-book is the most popular form of lead magnets used by marketers online. An e-book introduces your business to first-time visitors. It helps them to trust you and care about what you must say. For e-book to work as a lead magnet, you must ensure that it is not lengthy, so that it is easy for your audience to consume. In creating your free- e-book, you must ensure that it is about a topic your customers will love. 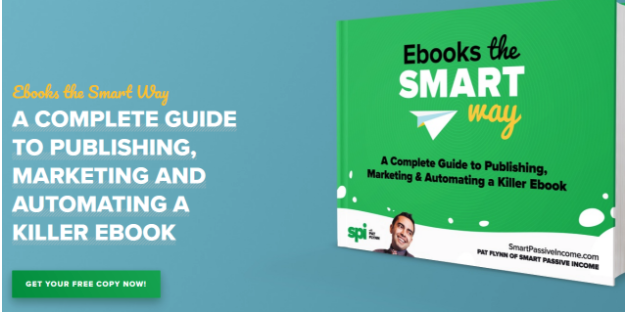 The free book should showcase your expertise and help introduce your subscribers to your products or services. That is the only way it will be beneficial to your visitors and your business as well. There are many ways you can create a free e-book. One way you can create a free e-book for your audience is to use your popular blog posts. Gather all the posts that are in the same category. Use blog posts with the highest number of views and comments to create your free e-book. You can easily transcribe your webinars and podcast to create a free e-book for your audience. Tools like Transcribe and OTranscribe can come handy in the process. You can also decide to write your e-book from scratch. But ensure that you have a solid topic and enough resources to make your e-book valuable. Once, you have the content of the e-book ready, it is time to create a cover for it. Creating a cover for your e-book is easy. You can use Canva to do it. If you can’t use Canva, you can get someone to design it for you at Fiverr.com or Dribble. You can host your free e-book using cloud storage, (Google Drive, Dropbox, Box, etc. ), an email list provider, or host it on your website. Example: Pat Flynn compiled a ten-post series he created on “How to write an e-book” and turned it into a free e-book for his website visitors. A checklist is a document, usually 1-3 pages that summarizes a blog post into actionable lists. It is an easy-to-create lead magnet. You don’t need extra content apart from what you have on your blog posts. Checklists have the best conversion rate amongst all the lead magnets. This is because it summarizes the blog post, providing easy to consume information for readers. For a check list to be effective, it must match with the message of the blog post and be attractive. Again, you can use Canva to design your checklists or hire professional designers on Dribble or Behance. Below is an example of Brian Dean’s checklist on "Google's 200 ranking factors: The complete list”. A free trial is a great incentive to get people to sign up to your mailing list. It helps you to get the email addresses of people who are really interested in your product. You can also use free trials prospects get better insight into your product. It also encourages visitors to try out products that they wouldn’t otherwise have thought of purchasing. By the time they try it and they like it, buying the product will be a breeze. By giving them free trials, you are giving them a taste of your product or service. Even if they choose not to continue to become a paid member, you can still communicate with them through the email address provided. Free trials are great for businesses that have recurring payments, such as those that sell software as a service (SaaS) products, membership programs, online courses, tools, etc. For the offer to convert, the free trials must be of interest to your visitors. You can easily offer a 10-30 day free trial period as a lead magnet to get them to try your product or service and collect their emails. 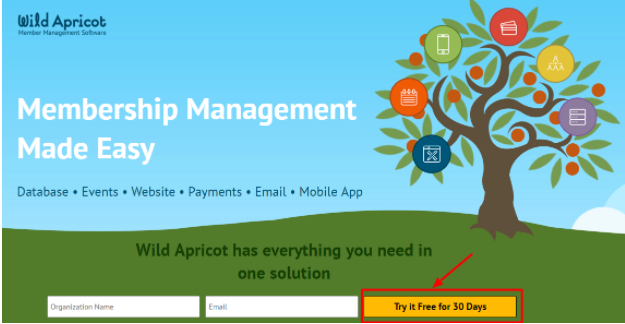 Example: Wild Apricot, an online membership management platform and web-based software, offers a 30-day free trial for its software. A tutorial is a piece of content you can create to teach your audience how to do a specific thing. It can be delivered in a video format, audio file, pdf download, etc. When creating a tutorial, ensure that your headline is in a list format. For example, “7 steps to creating and profiting from online courses”. Adding numbers to your headline helps your readers to know how many steps it will take them to get the desired result. With this, you will get a better result. Example: David Siteman Garland created a tutorial on "7 proven steps to creating, promoting & profiting from online courses" as a lead magnet on his website. An early bird discount is a great way to encourage visitors to get on your waiting list or make a purchase before the price goes up. The fact is, people love getting things early, especially when it involves saving money. It is a great way to reward enthusiastic prospects who are already interested in your product/service and also a great way to increase sales. You can use this lead magnet for an upcoming product launch. It will help you to collect emails of your prospective buyers and eventually turn them into loyal customers. 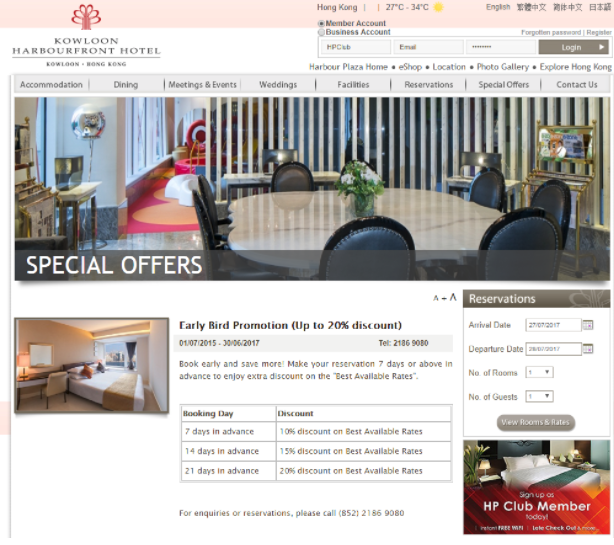 Example: Check out Kowloon harbourfront hotel. They offer early bird promotion to get people to book early. Demos are a popular form of lead magnets for companies that sell products. It is a way to get people to visit the website to part with their email address if they want to see how the product works. A demo contains an overview of how a product works. You get to see its features and benefits and how to use it properly. Most visitors will gladly provide their email address in order to watch product demos, especially if it is what they really need. 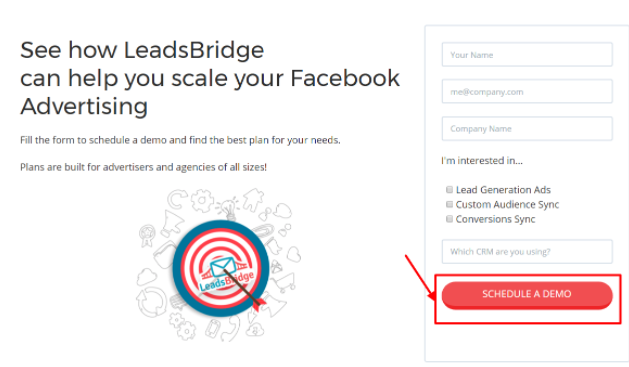 Example: Below is a good example of a product demo lead magnet from Leadsbridge. Readers are more cautious of the information they consume these days. This is why you need to bribe them with quality and free lead magnets to entice them to share their email addresses. Offering a lead magnet that solves your audience’s problem is a way to show them you care. Once they find your freebies useful, they will share it with their friends and followers. This will help to improve your lead generation results. 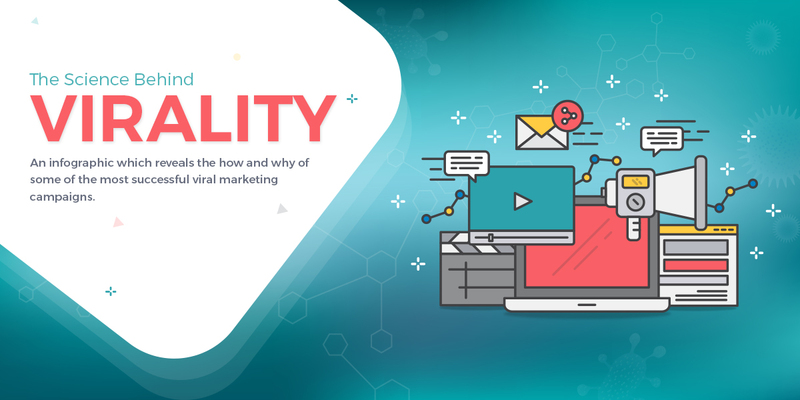 Gabriel "the architect" is a licensed Italian architect who suddenly decided to leave his 9 to 5 job and dedicate his life to digital marketing. Since 2016, he’s a full-time growth hacker and content marketing director at LeadsBridge.